Leasing Available from $10.24 per month! 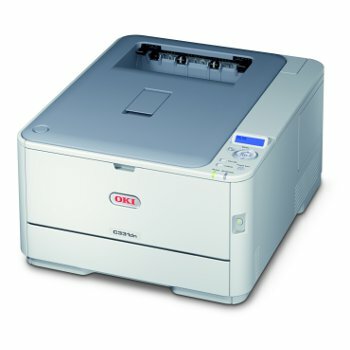 Looking for Oki C331dn & C531dn Series Parts? For small businesses and workgroups demanding superior quality at an affordable price, OKI brings you C331dn and C531dn Digital Color printers. Network-ready, they combine fast printing speeds, incredible print quality, duplex (2-sided) printing standard, the ability to print on a wide variety of media, and the legendary reliability of OKI products, backed by industry-leading support. HD Color Printing technology - Both printers utilize this unique OKI process for breathtaking output. HD Color Printing technology combines multi-level LED printheads and microfine toner for precise toner placement; deep, saturated colors; and fine detail on regular copy paper and glossy media. Exceptional paper handling - The C331dn and C531dn both have a standard paper capacity of 350 sheets: a 250-sheet paper tray plus built-in 100-sheet multi-purpose tray for labels, envelopes, transparencies, and thicker media up to 80 lb. cover (220 gsm). They can print everything from 3" x 5" cards to banner-size sheets up to 8.5" x 52" 2. And their paper capacity expands to 880 sheets with an optional 530-sheet 2nd tray. Perfect for virtually any printing environment - The versatile C331dn and C531dn both work beautifully in the most popular operating system environments. They come with PCL 6, PCL 5c and PostScript 3 emulations, for professional-looking text and graphics. Unmatched warranty support - We're so confident in the reliability of the C331dn and C531dn that we provide an industry-leading 5-year warranty on their printheads, and a 3-year Carry-In/Depot limited printer warranty and optional coverage extensions.3 If you need technical assistance, you can speak to a live OKI expert located in North America by calling 800.OKI.DATA (800.654.3282) at any time.3 If you need high-speed, highly flexible printers to increase the productivity of your business or small workgroup, the compact C331dn and C531dn color printers from OKI are your ideal choice. Color Swatch Select the color swatches that match your target and simply use their RGB or CMYK values while creating your document to ensure matching colors. Customize a swatch by setting the Hue, Saturation and Lightness to target your custom color. Color Correct Makes it easy to adjust colors commonly found in applications like Microsoft Word, Excel and PowerPoint. It also lets you adjust the overall color of a print by controlling the lightness, darkness and contrast of images, and the intensity and lightness of the colors. Print Job Accounting Software Enables tracking of color and mono printing costs, easy monitoring of printing activity, and greater control of printer usage. It generates reports for administrative, bill-back or cost-accounting purposes. User permissions can be assigned and are stored on the printer, so the system is totally secure. Duplex (2-sided) printing It's standard on the C331dn and C351dn. Use both sides of a sheet rather than two sheets. Saves paper-and is even more energy-efficient. Automatic ECO Mode These printers optimize the print time for small jobs, using less energy. Same terrific output, faster throughput, lower power consumption. Everybody wins. Deep Sleep Mode When left on for an extended period, the C331dn and C531dn slip into this mode, which uses less than 1.5 watts of power. One-piece image drum This long-lasting, user replaceable consumable remains friendly to your budget while lowering the number of items to dispose of and store. Energy Star compliance With their lower power consumption-especially in Deep Sleep Mode - and standard duplexing, these printers meet the government's standards for energy efficiency. 1 Published performance results based on laboratory testing on simplex sheet (1 side). Individual results may vary. 2 Based on ITU-T Test Chart #1. 3 Larger files may require additional memory. 4 Available in the U.S. and Canada only. Duty Cycle: C331dn - up to 45,000 pg./mo. ; C531dn - up to 60,000 pg./mo. Paper Sizes (Min/Max): Main Tray from 4.1" x 5.8" to 8.5" x 14"; Multi-purpose Tray from 3" x 5" to 8.5" x 52" banners3; Duplex/Optional 2nd Tray from 5.8" x 8.3" to 8.5" x 14"
1Published performance results based on laboratory testing of simplex (1-sided) print speed. Individual results may vary. 2Requires optional SD memory card. 3Optimal performance on larger files may require additional RAM. 4Based on ISO 19798, letter-size pages. 5,000-page High-Capacity toner for C531dn only. C331dn ships with 1,000-page and C531dn ships with 2,000-page "starter" cartridges (CMYK). 5Estimated life, based on 3 pages per job. 6Available in the U.S. and Canada only. size: 16.1" x 19.8" x 9.5" (410 mm x 504 mm x 242 mm" 16.1" x 19.8" x 9.5" (410 mm x 504 mm x 242 mm"